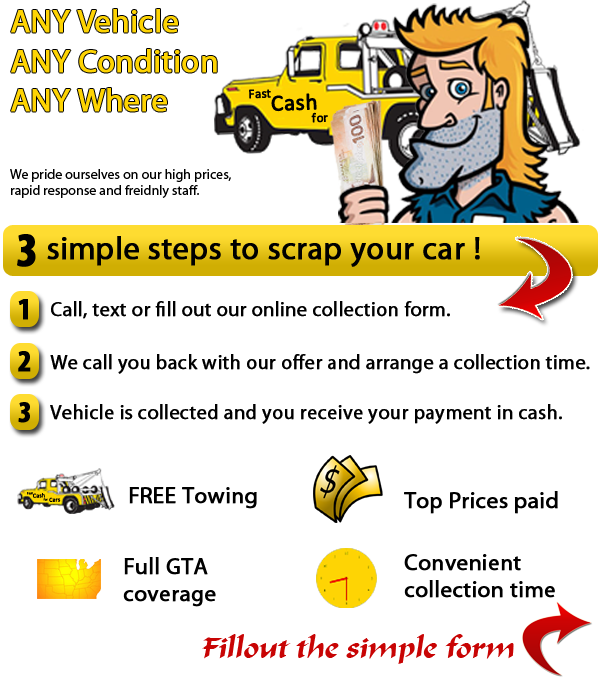 Fast cash for cars can collect your scrap car from anywhere in the GTA. We are dedicated to our customers and you can be sure to get the best possible service when asking us to `scrap my car’. A quality fleet of recovery vehicles and well trained drivers and office staff is our key to making sure your scrap car is collected when you want and with as little hassle as possible. Please look at our testimonials to see previous customer’s reviews. We have years of experience collecting repairable / scrap cars and take customer satisfaction very seriously. Our dedicated and friendly team will be happy to assist in any questions you have and explain how the scrap car process works. Cash: We can guarantee a FREE TOWING ANYWHERE in the GTA. We also pay top scrap car prices for your vehicles. You can be sure that we at Fast cash for cars offer the best prices across the board. Speedy: We have a large fleet of recovery vehicles and drivers operating car scrap services over the GTA. As a result your scrap car is collected punctually and at a time convenient to you. Power Train failure – You cannot justify spending a large sum, you will be surprised how much we pay to collect car scrap.